The Sontag Foundation to donate $1 million for rheumatoid arthritis research to the Arthritis National Research Foundation. The Arthritis National Research Foundation is an efficient steward of charitable dollars invested in arthritis research grants,” continued Sontag, “that’s why we are proud to partner with ANRF to fund cutting-edge research. The Arthritis National Research Foundation will receive an unprecedented $1 million donation from longtime supporters, The Sontag Foundation. The kindness and generosity of the American spirit is alive and well in one family working quietly to improve the lives of millions. Rick and Susan Sontag preside over The Sontag Foundation in Ponte Vedra Beach, Florida. For the past eleven years, The Sontag Foundation has partnered with the Arthritis National Research Foundation (ANRF), a national nonprofit organization based in Long Beach, CA, to completely fund a research grant in rheumatoid arthritis. A luncheon to honor Rick and Susan’s commitment will be held on September 30 at the Long Beach Yacht Club in Long Beach, CA. Touched by the luncheon in their honor, the Sontag’s had a surprise of their own. Rick and Susan Sontag’s roots are in Southern California, having been raised in Long Beach and educated at Harvey Mudd College and Pomona College, respectively. “My mother suffered the devastating effects of rheumatoid arthritis for over 35 years and it finally ended her life,” said Sontag, explaining his family’s heartbreaking connection to this disease. 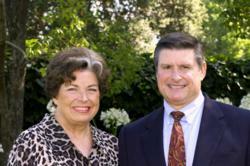 The Sontag’s built a business, raised three children and currently reside in Ponte Vedra Beach, Florida. Now their business is philanthropy – their foundation funds cutting-edge medical research in brain cancer and rheumatoid arthritis and on projects to improve the lives of those less fortunate than they in their northeast Florida community. Arthritis National Research Foundation grant recipients represent the top of a highly competitive field of young M.D.-Ph.D. scientists at nonprofit research institutions across the U.S. Applications are reviewed annually by the Arthritis National Research Foundation’s Scientific Advisory Board of world-renowned physician-scientists. Two Sontag Foundation Fellows of the Arthritis National Research Foundation will attend the September 30 event: Iannis Adamopoulos, PhD, of the University of California, Davis, and Joyce Wu, PhD, of the University of Arizona. Rick and Susan Sontag decided they wanted to make a difference during their lifetimes and set out to do so. Their generosity and commitment is an example to all Americans. The gift to the Arthritis National Research Foundation will positively impact science into the future, potentially funding the next breakthrough for new treatments and a cure. Since 1970, the Arthritis National Research Foundation, a tax deductible charity based in Long Beach, CA, has supported outstanding young scientists who have become innovators and leaders in the field of rheumatic disease research, autoimmunity and inflammation. From the discovery of Tumor Necrosis Factor (the molecule that initiates inflammation in arthritis) to genes involved in lupus, their research accomplishments have made an impact. ANRF’s approach is to fund the next generation of researchers to encourage their continued commitment to research in arthritis and related diseases. These scientists, supported by ANRF funds, will lead the scientific charge for a deeper understanding of the genetics and molecular mechanisms of the immune system and autoimmune diseases. This new understanding, we believe, will provide the scientific facts and key information to develop new therapies that can alleviate the suffering of patients with arthritis and related diseases. To help support Arthritis Research you can make online donations at our website. 91 cents of every dollar donated is placed into research programs. For more information please visit: http://www.curearthritis.org.